Sweet and Lowdown is a sparkling evening of the music of George Gershwin co-starring KT Sullivan. KT provides the sweet, (Stephen Holden wrote in The New York Times that she is "...the cabaret equivalent of whipped cream atop a surprisingly nutritious dessert.") Mark, of course, provides the low-down. This is a fabulous two-act evening that includes some of the hit numbers from Mark and KT's award-winning off-Broadway Gershwin Revue, "American Rhapsody". 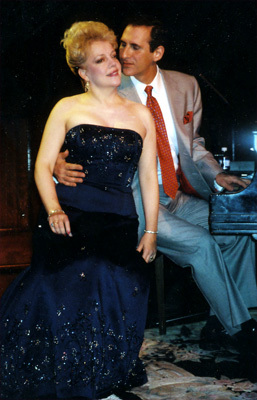 Among the highlights in this show, Mark and KT reenact the entire film, Shall We Dance and Mark performs his powerful signature arrangement of "'SWonderful" and "Rhapsody In Blue".